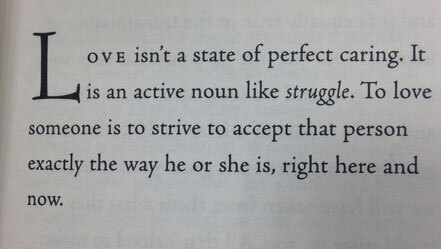 From the book "The World According to Mr. Rodgers: Important Things to Remember"
Do you strive to fully know yourself? Do you know what is the difference between self-neglect and selflessness? Is self-neglect necessary for selflessness? Is it selfish to spend time knowing myself? Or could it be that I could be more selfless and better love others as I truly know myself and love myself? At first glance it seems like a contradiction. But could it be that self-neglect and lack of self-awareness ultimately causes disharmony with and even harm towards others? Let’s allow these questions to settle for a moment and switch gears for a bit. I’ve practiced yoga for about 8 years now and every time I bring myself to the practice, a definition of my current self emerges. When I am really engaged with the work, I become very aware of my physical boundaries and my limitations. I can see where my imbalances are. My unconscious tendencies are suddenly revealed. I am confronted by my patterns of habit and oftentimes I'm given a decision about whether I want to do anything about them or not. And it doesn’t matter if I am working on my handstand, aligning myself in warrior 2 in a chair or practicing stillness in a restorative posture on the ground - I learn something about myself by paying a lot of attention to myself. Sophocles provided a little nugget of wisdom a long time ago with the simple phrase “know thyself” and yoga provides a lot of tools towards that end. Yoga recognizes that the body doesn’t lie. Underlying the tension in the trapezius, hidden in the stiffness of the hips, concealed in that collapsed cervical spine is a message from none other than yours truly. Yourself. Your body not only tells the truth, but it tries very hard to work for you. What do you know about yourself? Are you afraid of yourself? But how aware are you of what exactly you are giving and doing to your body? Do you know what things you do to yourself that are actually harming your body? Consider certain foods or certain activities (and yes, sitting counts as an activity). When you eat a sugary and/or caffeinated drink, do you really understand how that is affecting your mind and your body and perhaps even interactions with others around you? When your shoulders are tense, your hips constricted, or when you suddenly find you have thrown your back out simply by reaching down for something, are you aware of exactly what things contributed to your current state of pain and discomfort? And what about when a major disease hits the body or mind and brings you down? Could it be that your state of disease is a representation and embodiment of some things you have been neglecting about yourself? Self-neglect is not the same as self-surrender. When we are in loving relationships with others, we do surrender ourselves from time to time for their sake. We see others in their distress and assist them; when we are down others lift us up. But self-neglect is not a wholesome activity for you or even for others around you. At the end of the day, who knows you better than you? Others cannot always be there for you when you feel you need them, nor do they at the end of the day really understand everything going on inside of your mind and body. We are finite and we have boundaries. Each and every one of us are ultimately responsible for caring for our own self. Self-neglect is self-harming and can very much cause a negative effect on others. Be careful if you tend to confuse self-neglect with self-surrender. One path leads towards true love; the other leads to a thorny road of disharmony and discontent. So if you could take time to understand how a certain food or drink shifts your energy and makes you grouchy and impatient towards others or if you pay attention how the tension in your neck and shoulders makes it hard to be present with others, then you are beginning to win some ground in the battle for love. Through self-awareness you could learn why a certain activity keeps your hips from functioning how you’d like them to and you could really start to pay attention to how the discomfort affects the level of interest you have with others. You could start to understand why you keep getting the same kinds of sickness year after year or why your immune system always fails you at a certain time of year. Is sickness a time where you choose to listen to yourself or where you ignore yourself and what your body is telling you? Are you prone to escapism, not wanting to honestly look at yourself? Do you respect yourself and your boundaries and limitations? Listen to yourself and love yourself and then you can really love others. I’m a big fan of the treasure trove of truth found in the Bible. There’s a passage in Corinthians where the Apostle Paul talks about love and this idea of growing up and being fully known. I'm going to share the excerpt so that you can continue to think through your own ideas of love and self-awareness. My encouragement to you is this: practice self-love. Grow up and know yourself. Put aside your childish ways, exercise some responsibility over yourself and don't be afraid of yourself. Encounter yourself as you are and be patient with yourself. Honest with yourself. Kind to yourself. With faith, let hope guide you. See how this process of maturity begins to increase love and selflessness in your interactions towards others. How do you learn about yourself? Do you listen to yourself? Love yourself? Practice - Does It Ever Become Effortless? I had an interesting text message conversation with a dear friend of mine just recently. It was one of those dig deep and think about what you are teaching your kids kind of conversations. What's the best thing and what's the worst thing we thought we were passing down to them? Once we hashed through the good, the bad and the ugly, she shared with me that our next step should be application - how we move forward with what we recognized. She talked about wanting to live out what we captured from our self-reflection exercise (keeping up what we determined was good and restraining ourselves from the bad) which she described as "applying them continuously without effort." There was a part of me that got what she meant. Yeah, you know what I mean. This vision we all have of being that amazing superhero someday who has "done it all", "been through it all" and can do perpetual good and never bad without dropping a bit of sweat. "Oh that? Eh, whateves. I got that." But then that part of me that really likes to ponder and delve deeper hit the pause button. Wait a minute. Have I ever really felt that anything I've experienced in my life became "effortless"? Take walking or chewing food. That was a huge struggle to learn initially but to this day, is that something that happens without some kind of effort on my part? For sure, those two tasks have become so much a part of my conditioning that after a fashion I can autopilot and take one step forward and then another or in the case of eating I know how to move my jaws around to obtain properly sized food particles for my stomach. Ah, the illusion of "effortlessness" creeps in (and truthfully, those are practices that always have room for improvement). But you know what? There are times I trip and times I still manage to bite the inside of my mouth or my tongue (or don't even swallow right). And usually when did that happen? When I became lax in my effort. My effort in the work and my attention to it. I thought too about my yoga postures practice. Take downward facing dog - a pose I've practiced countless times. I've conditioned myself to have my body accept the shape of the pose but you know what? It always takes effort. I still have to engage all my muscles properly to hold up my body in the position. Yes, some days downward facing dog comes more easily to me than others but it always ALWAYS takes work. The first bit of work is just to set the intention - I have to even want to get my body into the pose. Once I do get in and start becoming aware of what is going on in my body to support the actions of the pose, I have to be honest with myself. Am I hanging through my joints? Am I preferring to bear myself more so through one leg than the other? Am I weighing down only through the heels of my hands and not using the mounds by the finger joints? How is my breathing? Every day when I ask myself these questions in the pose, I get different answers. Every day is different. And to be honest, unfortunately I don't ask myself every day - my attention shifts elsewhere, like "you need to get such and such from the grocery store today" or "don't forget the rent is due" or "what so and so did to me really bothers me still" and on and on to everywhere and anything but what I am actually doing. Here's another thing - even though most of the time I practice downward facing dog on one plane (the ground), something really interesting happens when I take that same shape with my body and put two planes of action to it, tilt my body to work against gravity in a different way or even take it on a different medium (water). Or hey, keep downward facing dog oriented like usual and try to hold it for longer than 10 breaths with other people involved. And if you're not sure what I meant by involved, take a look at one of the photos I've included. Suddenly I become more aware of certain muscles groups or I connect differently with my breathing. My core muscles awaken in a novel and unusual manner. Effort! Wait, but it's just the same old pose - I thought it would become effortless! Ha ha! What a strange little lie I am telling myself. And I came to the realization that if downward facing dog always always takes work and my full attention, why do I sometimes get led away by this illusion that anything else in my life will be any different - will eventually become "effortless"? Living out my good intentions and diminishing my unwholesome prior conditioning will always require my full attention and effort. Maybe after lots and lots of PRACTICE it becomes incorporated into my behavior, but if I am honest with myself, I still have to actively and with effort set the intention to practice to do good and lessen the bad daily, hourly, minutely. For as long as I have breath in this life. Turn away from evil and do good. Search for peace; and work to maintain it. Thank you dear ones for your attention to this blog article! My prayer is that you are blessed and encouraged by it. 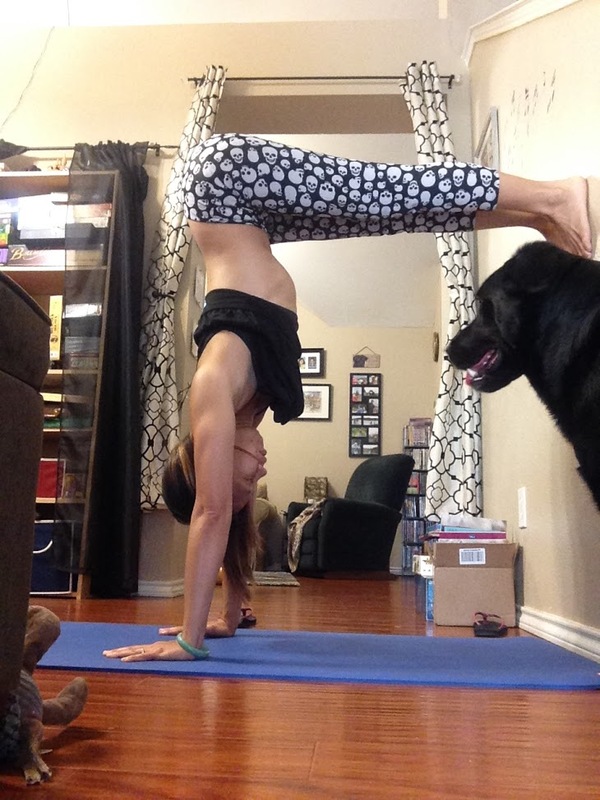 Just a few different ways to downward face your dog. Yes, it's harder to practice with your feet on the wall and a dog telling you that it's time to play ball with him. Yes, it can be just as hard with a chair if you tell yourself to make the work between the hands and the feet as equal as possible. With other people involved? Need I say more? I have been blessed and hope you have been too. Spring brings about a sense of renewal and interest in trying something new. 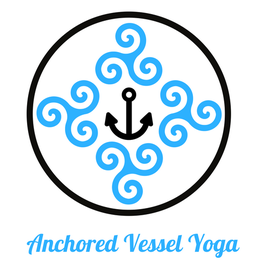 For the past two months I have had the honor to share the practice of restorative yoga to the community. For many students, this was a new experience - a new way for them to approach the process of self care. A new way to practice self-love without being selfish. I was tremendously blessed to be able to witness students coming together for the first time and be able to, in a room full of strangers, completely relax. I've often wondered if what ails us may start to turn around by simply connecting to a state of true relaxation. Even through we are surrounded by many modern conveniences, we still encounter aggravating circumstances and the stress we hold onto from those things begins to have a deleterious effect on the body and the mind. It begins to negatively affect our health, our behavior and our interactions with others. Could it be that our true self that wants to freely express joy, peace and love to others is wrapped up in a thick cloud of needless suffering held onto by the body? I was amazed after these restorative yoga sessions to see these students from all over the metroplex - Garland, Richardson, Plano, Allen and Wylie - who didn't know each other beforehand open up after class and interact with gentleness, kindness, and good-heartedness towards each other. An unmistakable warm and vibrant energy. You could just see that there was finally a sense of freedom from something and in that freedom a willingness to move forward towards something new. 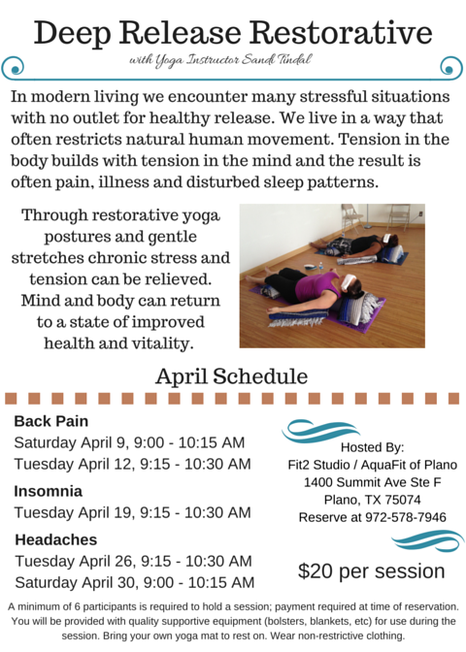 My hope with the April deep release restorative series is that anyone who has been needlessly suffering extensively from back pain, insomnia and chronic headaches (tension or migraine) finds relief and even freedom from their pain. That they feel empowered to manage and overcome their difficulties. That in the simple practice of relaxing, letting go and trusting they get closer to the light of love and with confidence journey on towards the new. Hello and Happy Leap Day to Garland students and beyond! 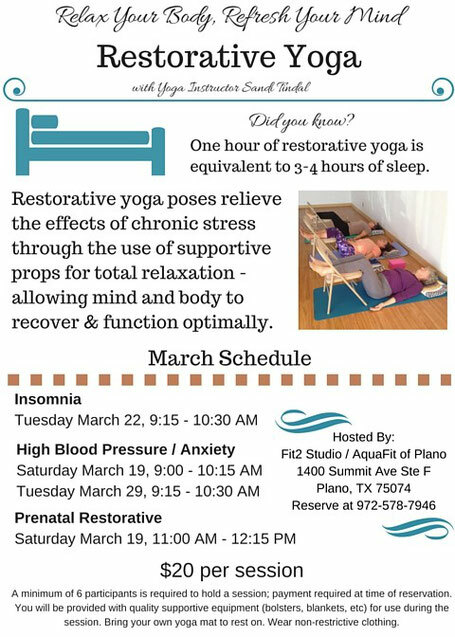 I'm pleased to share that for the month of March restorative yoga will again be offered in Plano. In addition to offering a prenatal restorative session, I'll once again focus on different topics that many of us either have direct experience with or know of someone who does: insomnia, high blood pressure and anxiety. Chronic insomnia can have a negative impact on your health, increasing your risk of depression and high blood pressure. About 1 in every 3 adults have high blood pressure and only about half of those diagnosed have their condition under control. And did you know that surpassing even depression, anxiety is the most common form of mental illness in the United States? It's estimated that 40% of adults suffer from an anxiety disorder of some kind. Come discover how restorative yoga can help you or someone you care about manage their condition. Sessions fill up quickly so sign up soon! I've been to many a yoga class where the wall is used as a safety in case you fall. Learning how to balance on one leg? Get close to a wall. Want to go upside down? Get close to a wall. Oh, but the humble wall can be used for so much more! After my Aqua Kriya Yoga training I began to see the wall in a whole new way. My teacher, Camella Nair, had showed us the importance of having surfaces for the body to stabilize against in order to find total muscular engagement in the environment of water. The bottom of the pool is a great place to start but add in the magic of the pool wall and SHAZAM! My friend, if you think you know your core by just pushing against the earth in plank pose on your mat - well - add in the wall and you may be in for a pleasant surprise. 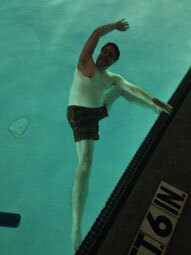 On the first Monday of the month I get to teach aqua yoga to a pretty strong group in the evening. You'll see in the first photo one of my students giving extended side angle pose a go using the pool wall as "the floor" and the buoyancy of water as a "wall-like" medium to help him find connection to his core. He's got two planes of support and you know what? The more planes of support and places of resistance you give the body, the more engagement you'll discover through the entire core. And core is not just those six-pack muscles, my friend. Okay, remember how I talked about adding in your friend the wall to your plank pose? Try this. Set up your plank by placing the bottoms of your feet up against the wall. Let your toes be curled; you're going for a sense of the heel of the foot stacked over the ball of the foot. Push your feet (heel and ball) into the wall and push the earth away. Soften your heart a bit more open and adjust your gaze so you sense all sides of the neck long. Feel something different? 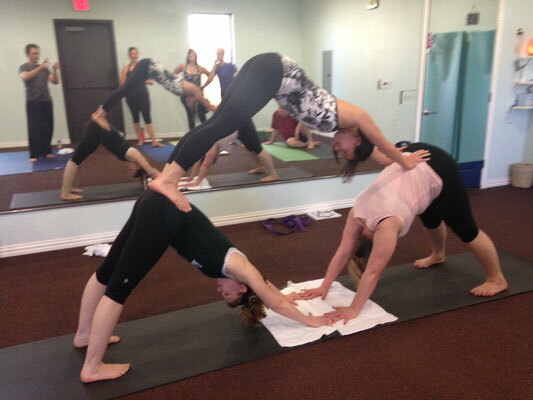 If that wasn't interesting enough for you, try side angle pose with the arm extended over the side of the head and fingertips pressing into the wall like you see these students from my yoga class in Richardson doing here. This action allows you to resist dumping your weight down through the front leg and find matched strength and balance through both legs. The pose is more centered around your core - just like you would experience in the pool variation. Now maybe you thought adding the wall was so-so for plank but if you noticed the line of action through your core that awakened through this you could bring this into an interesting arm balance pose called Eka Pada Koundinyasana II. In this arm balance the muscles through the hips and legs need to be adequately prepared so that one leg can prop up over the same side arm. Bring in those chatturanga arms (elbows bent with arms still alongside and close to the ribcage). Add that foot press into the wall for the other extended leg and HELLO! 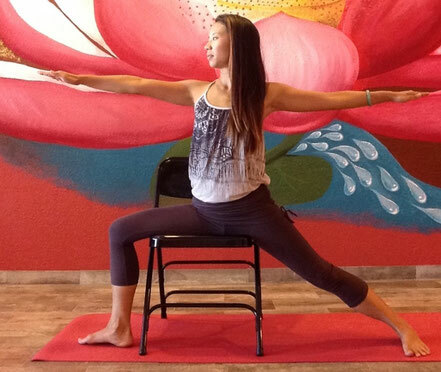 You're able to organize the pose better by allowing the body to coordinate as a whole (with the core muscles) and not force this balancing act entirely upon the delicate bones through the shoulders and the wrists. These students in Richardson here in this photo found some lift in this pose thanks to good ol' wall. Core connection through the wall? Yes. Walls, walls, walls. Every morning I walk my son to school, we both get to play the game of holding steady the forward facing dog. That involves none other than our dear pal Bishop. Bishop the black lab-inspired canine who cannot help but to walk ahead of us as if he knows where we are going. Bishop O' the energetic legs who creeps, creeps, creeps ahead. Bishop who is the constant receiver of our mantra "Get back, get back, get back." About one year ago I was surveying the realm of episodic shows on Netflix. One in particular caught my interest. Cesar Millan's Leader of the Pack. What an interesting premise for a show. Here's a guy who's rehabilitating problem dogs left at shelters and people are coming to compete for ownership of said dogs? Some of these people are from out of the country. Wow. That not only intrigues me but just tugs at my heart-strings in so many ways. Restoration and renewal. What magic is this guy doing that makes these people really want these dogs with difficult and dirty pasts? Our family adopted Bishop while we were living in Washington state. He was found wandering along a road and no one ever came to claim him. We were quite puzzled with the length of his stay at the shelter because he really was quite well-behaved plus already potty-trained. Physical health issue: diarrhea. No biggie compared to just losing a dog to cancer. 1) Pulling on the leash while walking. No, let's rephrase that. Dragging you behind while walking. 2) High excitability when seeing other dogs. Not aggression, just pure excitement. Now, sitting in my living room watching Cesar it all made sense. 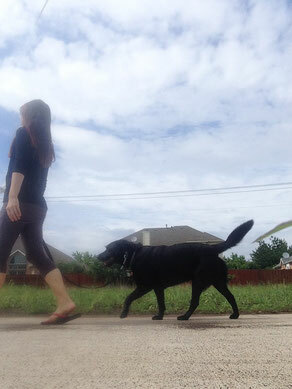 "The leader of the pack" needed to exhibit calm, assertive energy for his/her dog. Short, loose leash. Walk with intention. Don't let the dog take the lead. So simple! But oh, so hard to actually do! Practice some more. Sigh with exasperation. Cry for help! Then a blessing. Practice with the help of a trainer that is trained by Cesar Millan? What a difference. Guidance from someone - a live person! Art Ortiz of DogFit Dallas is an amazing dog trainer by the way. Let me know if you need his information. 1) Rajas makes Bishop want to pull too far forward. That really high state of excitability that sometimes appears on our walk, usually due to stimulation such as the sight or smell of another dog is a rajasic one. High energy that makes Bishop jump up and down (for joy?) or dance around me like a maniac. "Look, look, do you see THAT over there?" It's like when I sit down for meditation but my mind cannot help but jump around and gravitate to what it thinks is "so important" at the time - something I need to get done for my family or something I really want my students to learn. Bark, bark, bark. 2) Sometimes there's something that Bishop smells along our walk and then. Yes, just. Halt. Stop. Stuck. Inert. Tamas. Nose pressed hard into the ground. I want to keep going forward but he's holding me back. A dullness drops over the situation (though I suppose whatever his nose has found is not so dull to him). But he's suddenly forgotten and lost sight of our purpose together. It's sort of what I liken to the tamasic state. 3) When I sense a connectivity between us that even gives me comfort to drop the leash - we have found the sattvic state. Distractions are there but do not distract. They are potential disruptions but Bishop stays focused and moves gently forward alongside me with a calm energy. Side by side with direction. He's aware of my movement and pace and I'm aware of his. No jumping ahead and no pulling back and down. Balance. Calm, assertive energy.  Sattva. I think it's so cool that Cesar yoga-speaks. Well, I've never heard him say the word sattva but the guy sure understands the idea in his own doggie-like way. As I continue to practice walking with Mr. Bishop, I will keep thinking of ways to help my yoga students be more aware of rajasic, tamasic and sattvic states of mind. Today at lunchtime yoga in Garland we practiced some meditative walking in class together. I truly believe we all have the capacity to be more conscious of what we are doing in our lives, whether walking, sitting in front of a computer or learning something new in yoga class. Growing your awareness happens one breath at a time, one step at a time. Hold steady the forward facing dog. "There are no riches above a sound body." Cheers to my Garland lunchtime yoga friends, to the Garland community and beyond! 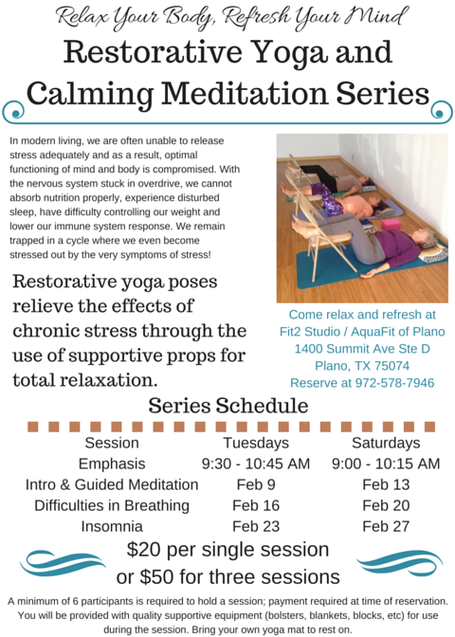 I'm pleased to offer a special restorative yoga and calming meditation series in Plano during the month of February. This practice is near and dear to my heart and I'm very blessed to have this hosted by AquaFit of Plano in their beautifully peaceful studio space. Restorative yoga differs from a typical yoga class in that the emphasis is on total relaxation of the body. We accomplish this by specific positioning and supporting the body generously with comfortable props. Due to being blessed by continuing students in Garland (and the support of my dear husband), I've been able to invest in the equipment required to share this fabulous practice. I invite you to join me. Let's experience a way to completely relax and refresh your whole being together. From my heart to yours ~ Namaste.